Evie's world has changed for the better. She got SMO's, or AFO's. I've heard a lot of acronyms, and this was just another set of them until I realized what they really meant. Supramellar orthotics or ankle-foot orthotics help a child to feel more stable so that they can learn to walk. In Evie's case, her ankles were so weak that she would try to keep her legs stiff so that she didn't feel so unstable. She was really afraid of falling over, and I don't blame her. Meet the cutest little SMO's you've ever seen. 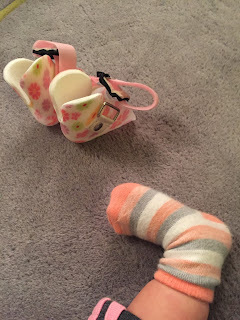 When you go to the orthotics place (we went to NOPCO, which is a veritable empire of orthotics centers all across the region), they will take measurements of your child's foot with a measuring tape (hopefully not necessary to make a cast of their foot). We waited a month for this appointment, so I would advise not waiting to make that appointment. You need a note of medical necessity from the doctor to got here. Evie did not like having her feet touched, and I had to hold her down. But once we got the measurements, we got to pick the little design and the color of the velcro strap. We waited 3 weeks, and then right before we went on a plane for Christmas vacation, we stopped by and picked up her SMO's. 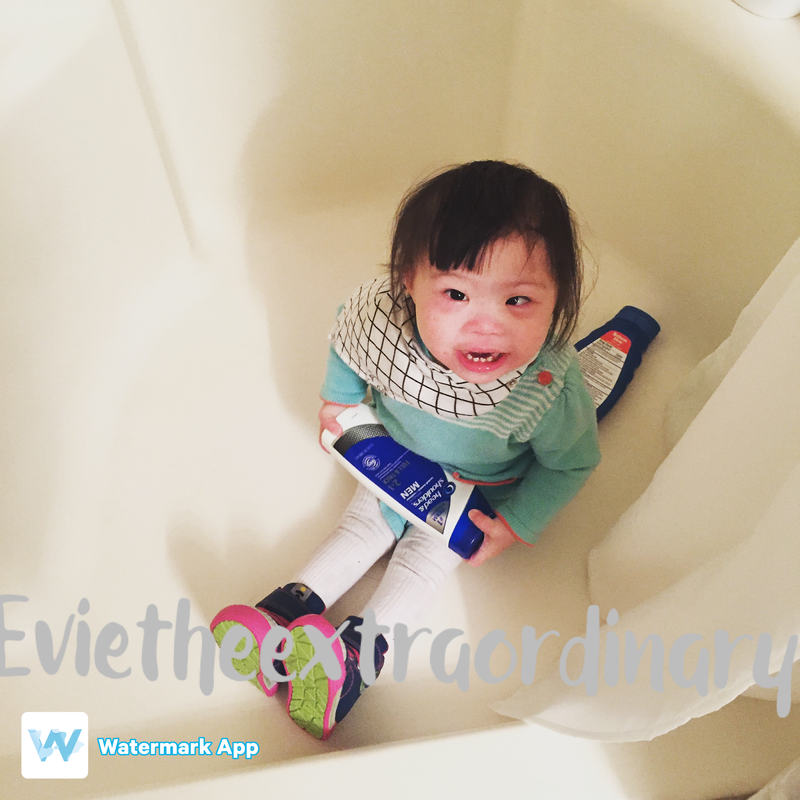 We didn't have much luck with Stride Rite, but I know many families who love them. They just didn't have a great selection of high tops in the store that we went to, and were pricier than I expected. The New Balance shoe that I ordered didn't come up as high as I wanted. But the Keenes that we ordered on Amazon--I absolutely love them. Here's Evie wearing her Keene's. When she started wearing her SMO's, her posture immediately changed for the better. Her legs weren't flopping all over the place, and she was happier about standing when we made her practice. Her crawling seems to be more confident too. Someone crawled into the shower when Mommy wasn't looking! When we first got the SMO's, we were given an instruction sheet about how to use them. We were to build up wear time gradually, from 2 hours a day to 8 hours a day. They then scheduled us for a 1 month follow up. I then proceeded to buy more shoes after knowing that I had to go 2 sizes up to make them fit. Evie has a nice repertoire of shoes now--classic (Keenes), silly (sparkly hippos), and trendy (black "Timberlands"). Evie honestly doesn't mind the SMO's. I think she knows that they make her do less work when she uses her legs. 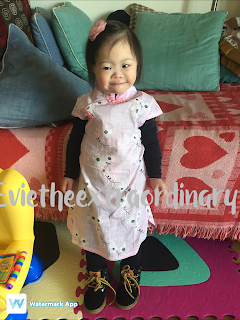 Here is a picture of her Chinese New Year outfit for 2017. What you don't immediately know is that this was the very first picture I have of her standing unassisted. She is leaning back against the chaise, but this is a huge improvement to standing and leaning forward onto a table in fear that she would fall over. I did wonder what would have happened if we had started SMO's sooner, but I believe that they were not brought up yet because her core was not strong enough. 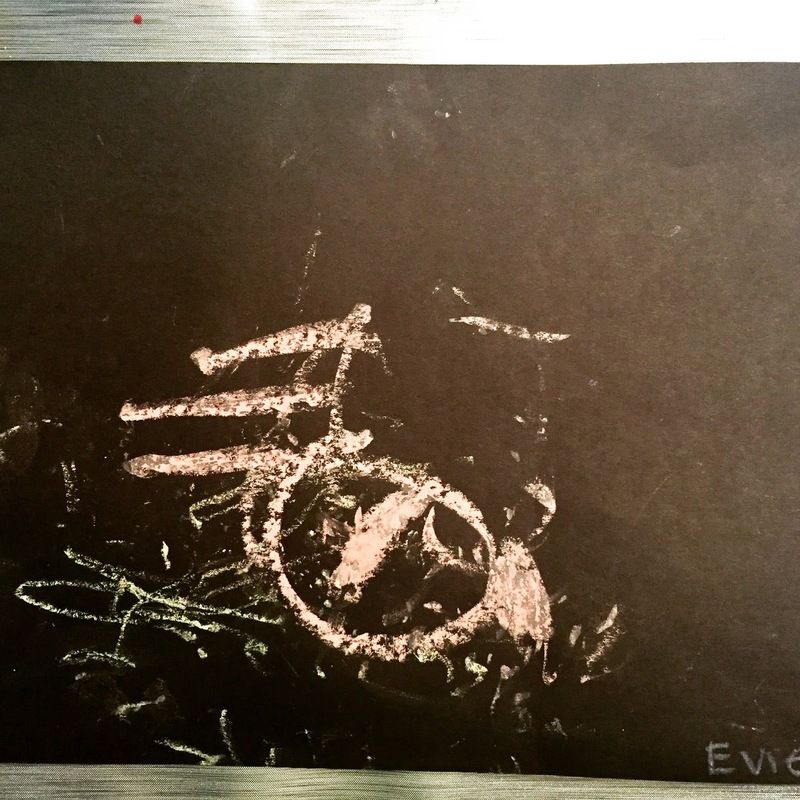 Evie is a lot stronger in her core strength now, which makes a huge difference. I will leave you with an image of Evie's very first piece of artwork that she brought home from playgroup. I believe it is absolutely brilliant in every way, but maybe I am a little biased.